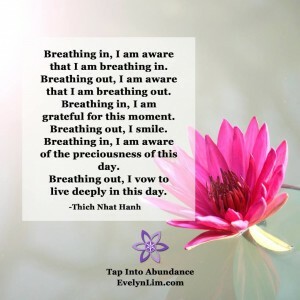 I have been thinking bout how we define and live in a full awareness of our present moments. So often I find myself ruminating about the past or worrying about the future. This makes allowing space to be able to be completely in the present, very challenging! Yes, when I find that moment where I am only in the present, it is quite illuminating. My worries about the future fade away and the weight of being stuck in the past loosens its grip on me. I feel a lightness in being just where I am. Author Kristen Neff, PH.D talks about mindfulness as the “awareness of present-moment experience with acceptance.” When we are aware of our here and now moment, we experience it most fully through our senses, not our thoughts. In thinking back, I don’t recall being very mindful when I was going to graduate school, raising children, working or caring for ill and aging parents. All of those times and stages were focused on getting through the overwhelm and endless list of things that had to be done for others. 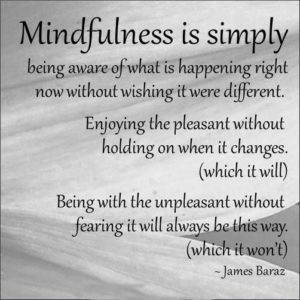 The concept and idea of mindfulness was not even a thought. If I had that awareness, perhaps I might have been better able to ride the waves of exactly where I was at in my present moment. That might have meant being totally in those moments with my children, my classes, my work and my parents, rather than always thinking beyond to the next thing I had to do. I also might have been more aware of what I needed for myself to juggle it all. Whether it is divorce, career transition, aging, retirement or bereavement, if we can allow ourselves to accept and be in the present moment of our transition, we might be able to experience through our senses where we are and have a greater understanding of what we need. Taking the time to be, can allow us to process where we are, and pave the way for our going forward. We can nurture this in our daily lives through everyday activities. What would it be like to experience them through our senses rather than our thoughts? Here are some suggestions for you to test out your everyday awareness and mindfulness. 1.Choose an ordinary activity, something you might do everyday, such as drinking a cup of coffee or tea. Can you feel the act of taking this drink through your senses of taste, smell, touch, sight and sound? If it is that cup of coffee or tea…what are the sounds that you hear in preparing it? Does it have a distinctive aroma and taste? Is the cup that you are drinking from a favorite…one that has colors, words, or a scene that you relate to? Do you have a heightened sense of enjoyment of this everyday experience because you are feeling it through your senses? A short walk at this time of year can introduce you to the sounds of leaves crunching under your feet, the sight of fall colors and their brilliance as the sun shines on them and the distinctive smell of autumn leaves. Again, be aware of how the experience of your walk through your senses makes a difference in how you feel. 2. When you bring your being into the present moment of drinking that cup of coffee or tea, or taking a fall walk…Check in with yourself. What are you feeling and where is that feeling in your body? You might notice that your shoulders don’t feel so tight and that your breathing has deepened. Whatever stress you have been feeling in your body may begin to ease and relax. 3. As you grow the sensitivity of your senses of sight, smell, taste, sound and touch, does it expand your awareness of the present and your experience of it? What falls away from you of the thoughts that seem to always be circling round in your head? Do you find that you have accessed a calk you didn’t expect? Perhaps this calm also brings greater clarity to help you deal more effectively with where you are in your transition or state of overwhelm. Give it a try. Let me know about your experiences. I would love to her from you! Here is a breathing meditation that may help you on your way to heightening your mindfulness. Enjoy! Women Reshaping Lives, LLC is a counseling practice dedicated to helping women face major life transitions related to career, retirement, aging, bereavement, separation, divorce and recovery issues.